CCDD's first bout for 2014 ! This double header will see Coffs vs Port Macquarie, a bout that's destined to put both leagues through their paces. This will be followed by an action packed, fast paced Men's Derby game ( yes, its guys vs guys)...Bruise Brothers will take on the Brothers from Other Mothers. Doors open at 4.30pm with the first bout kicking off at 5pm sharp. Children under 8 are free with a paying adult. Raffles and market stalls , entertainment and derby..who could ask for more! 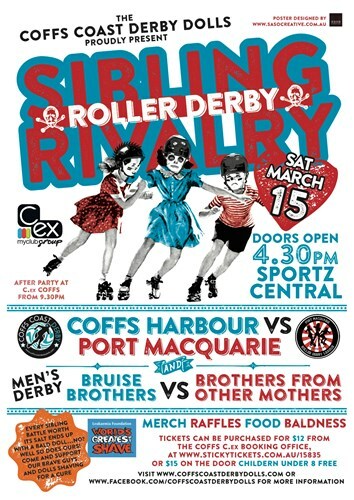 Our sponsor, Cex Coffs Harbour will be hosting the after party so book in the babysitters and join the teams in celebrating all things derby.